Social movements and individuals outraged over the verdict and decision to arrest ex-president Luiz Inácio Lula da Silva are protesting since early this morning (6) across the country in support of the Brazilian left-wing leader. Protesters spray painted walls in several cities, blocked major highway roads, and set barricades on fire to stop the traffic in different parts of Brazil. Further demonstrations are expected this afternoon in the states of Sergipe, Bahia, Rio Grande do Sul, Minas Gerais, Ceará, Goiás, Pernambuco, Alagoas, and more, to protest the Brazilian court system’s political persecution against ex-president Lula. “We are united. Organizations and parties such as CUT [Brazil’s largest labor union federation], FETAPE [federation of small and family farmers], Via Campesina [international peasant organization], Levante Popular da Juventude [youth uprising], the Church, they are all in support of Lula, protesting and fighting this [political] project. The powers that be thought Lula’s prison would lead to disengagement, but they are wrong. This is bringing the left together and will generate an even greater process of organization in Brazil's democracy,” Landless Workers’ Party’s Jaime Amorim told Brasil de Fato's Internet Radio Station. In the northeastern cities of Salvador, Bahia, and Natal, Rio Grande do Norte, messages spray painted on walls and tourist attractions read “Lula Livre” [“Free Lula.”] The watchword is also seen on banners at a road block protest in Paraná, a state in Southern Brazil. 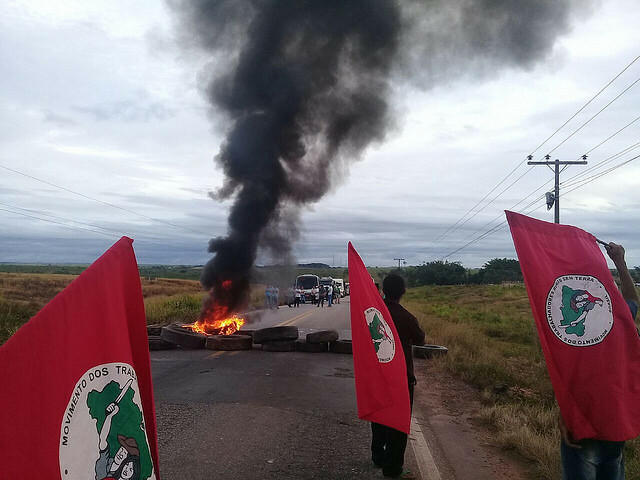 In Paraíba, in the northeast of Brazil, unarmed members of the Landless Workers’ Party (MST) blocked parts one of the state’s most important highway road in a peaceful demonstration and were attacked by an unidentified shooter. Lindinalva Pereira de Lima was shot and had to be taken to the hospital. There is also a large crowd gathering in São Bernardo do Campo in the outskirts of São Paulo, where Lula lives and started his political career, since last night in front of the Metal Workers’ Union, one of the most important labor organizations in the country. Lula is in the city discussing with his defense team what strategy to follow in response to judge Moro’s order. Judge Moro established a deadline by 5pm this Friday (6) for Brazil’s former president to turn himself in to the Federal Police in Curitiba, Paraná, where he will be held to start serving his sentence. The warrant was issued a few hours after the Supreme Court ruled against Lula’s petition to remain free while appealing his conviction. However, Moro’s order goes against the proceedings of the appeals court and the deadlines for Lula’s lawyers to file appeals.